So you just made that list. Yes, the list with your New Year’s Resolutions. Maybe you have written there that you want to exercise more often, and you also want to help other people around the world, travel to a different country and also meet people from other cultures. 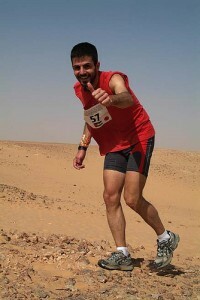 If the answer is `yes`, you will love to learn more about the Sahara Marathon 2010  on February 22, 2010. The Sahara Marathon is an international sport event to demonstrate solidarity with the Saharawi people and this year celebrates its tenth anniversary. Twenty different nationalities will face an enormous challenge in the Western Sahara desert while helping the Saharawis in refugee camps. This year the marathon will go to Dakla Camp and many Saharawi blogs are announcing and promoting the event. In Spanish, Todos con el Sahara , Sahara Deportes  and Blog de Montaña , write about the event. You can also find information about it in English  on the official site as well as at euskera , where you can find a blog dedicated to the event. Las aportaciones de todos los corredores y el dinero recaudado de particulares o instituciones es íntegramente destinado al proyecto de ayuda humanitaria en los campamentos. The donations from the participants and the funds raised by individuals or institutions will go towards the humanitary aid project in the refugee camps. Recomiendo firmemente a todos los corredores esta prueba. Es maravillosa la experiencia de correr por el desierto, además hay distancias para todos: 5, 10, 21 y 42. No hay excusa!!! I strongly recommend this challenge to any runner. 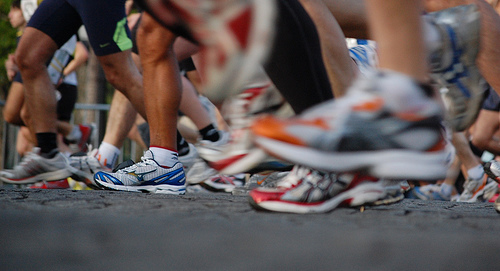 A race in the desert is a wonderful experience, besides there are distance options for all: 5, 10, 21 and 42 kms. You have no excuse!!! If you miss this, your second opportunity is the “Sahara Bike Race ” that will take place next April, with a blog promoting the event in multiple languages: Spanish,  French , English  and Italian . Many Saharawis have been refugees for more than 30 years, entirely dependent on restricted aid and big efforts by their political leaders and facing the indifference of the rest of the world. One third of them are children. Events like the marathon and the bike race described above are intended to raise funds to help them develop small projects but also to share with anyone a unique and rich culture, but also the problems they face to survive as a nation.